After a trip to London two years ago, I felt like that itch had been scratched. I was not really interested in going across the ocean again. 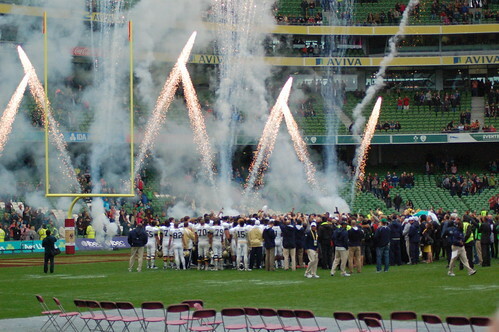 Then we got the news that Georgia Tech, that football team I spend too much time and money following, would be playing their first ever game in Dublin, Ireland. I couldn’t miss this opportunity so off we were once again for a couple days in Dublin and London. Georgia Tech won the game in the final seconds and the city of Dublin was amazing. The day after the football game there was a massive championship game for the Irish sport called hurling. We spent our evenings in pubs celebrating with the hurling fans. They didn’t know our sport and we didn’t know theirs, but no one cared. The Irish people made the trip with their humor and conversations. London was special in its own way, too, as we were able to catch some of the places we missed on our first trip. Our friends from London even joined us in Dublin for an evening and then dinner in London as well. We came back from London and I wanted to write all about it and then autumn swallowed me whole. We fell into the dual schedule of cheerleading and lacrosse and I lapsed into a writer’s block as I drove back and forth to practices. That, combined with the awful election season, left me without much nice to say and so this poor site has been left without updates for almost six months. As always. That doesn’t mean nothing has happened. I have been to a bunch of football games which were surprisingly more fun than expected and I’ve watched my girls grow and start to develop unique skills in specific areas, which has been very rewarding. I’ve been to some excellent concerts. I tried to write something about the amazing Paper Route show I saw and how it ties into the manic, emotion-bending times we are all living in now, but nothing good came of it. I’ve have some opportunities to spend time with family and with the Christmas season approaching I am hopeful for some more time together. Maybe the writer’s block will finally start to crumble and I’ll have something better to say. In the meantime, another autumn has passed and we are now full-on into the Advent season. If I’m lucky, I’ll have another period of “downtime” after Christmas and I’ll have some time reflect on a year that I can truly say has been unlike any other.